Okay, I admit that I mostly wanted to write this post just to use the title and to insert the obligatory English major's apology to Gabriel Garcia Márquez. I don't really have anything original to add to the overall discussion except that I've turned into my ex-roommate. 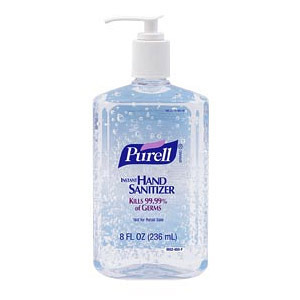 My roommate carried these little bottles around wherever she went and assiduously doused her hands after every public contact. She also covered her hands with her sleeves when opening doors, used her knuckle to punch elevator and ATM buttons, breathed into her own collar when on the T, and glared before shying away from any public coughers, sneezers, or snifflers. Although I come down with a cold with annoying, but typical, regularity once or twice a year, I never worried about the Germs Out There. I knew that too many rotten apple orchard slatherings could actually make me more susceptible to bugs by weakening my resistance or something, which was my lazy excuse for never remembering to use the stuff. When I had my usual checkups at Brigham and Women's, I didn't think about the fact that hospitals are teeming with germs. When I took the T, I didn't specifically avoid the runny-nosed, because what are the odds? I also didn't wash my hands overmuch. I mean, I did it when necessary, because I'm not a BARBARIAN, but I never went above and beyond into cracked-skin territory. Well, as a pregnant person, I am now officially a hypochondriatic germaphobe. A few days ago, I went to Safeway, dabbed at my hand basket with their handy alcohol-based wipes, and bought three pump bottles of anti-bacterial gel. I mused buying more from the already depleted stock, but I wasn't sure just how crazy I wanted to be. At birth class, I was That Person, who eyed one of the pregnant women with suspicion every time she coughed (five times), but that was more because she wasn't coughing correctly. According to what I've been reading (and was taught at culinary school), you don't cover your germy mouth with your hands, you cough into your elbow. At the Palo Alto Creamery, Mathra turned up his collar when the guy sitting behind him sneezed, snotted, and snorfled his way through his meal and asked if we should move tables. For the record? Mathra was never a crazy germaphobe either. He now has one of the bottles of anti-bacterial gel in his office. "You know, some people are like this all the time?" I said. "What a horrible existence," he responded. Are we being over-protective? Possibly. However, because I never took these precautions before, maybe we're just being sensible. I'm not stupid, I know it's because of the baby. I know all our instincts are focused on making sure nothing happens to the squirming, rib-kicking bug. Also -- and this is the fun part -- because all my organs are squished around and my lungs have decreased capacity and my entire body has increased fluids of every kind, I'm simply more at risk at having a regular flu bug turn into pneumonia. That's all. Oh, and a note on that increased fluids thing: suddenly the running nose and phlegmy throat I've had MY ENTIRE PREGNANCY are now a point of interest and examination for me. So is my usual coughing and snuffy nose that gets excited every time I bend over to pick something off of the floor. And my always-present allergies to dust and pollen. And I was so utterly convinced that pregnancy wouldn't change who I was. Sigh. This post is also to say: Yes, Mom, I'm washing my hands, wiping my nose, getting lots of sleep, and taking it easy. Oh, and a note on our Safeway brand of anti-bacterial gel: it smells exactly like my homemade limoncello, which is sending me very mixed signals.